Heyyyy! I’m back! We just got back from our amazing L.A. honeymoon(so many foods! so many comedy shows!). While I’m bummed to be back, I’m happy to be back in the kitchen! I pretty much dedicated my whole weekend to making recipes… And snuggling with the kitties on the couch(they’re preeetty pumped too have us home😉). You’ll definitely want to line your pan with foil as the sauce will drip down and create a big burnt sugar mess on your pan. 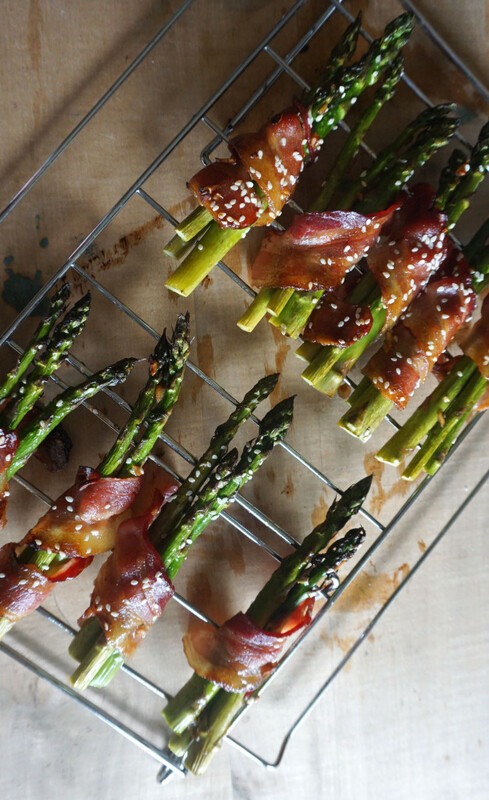 You could also probably cook these on the grill – especially if you secure the bacon with toothpicks and have a good grill that cooks evenly. I didn’t use toothpicks, but it would have helped keep the bacon wrapped more tightly. This would probably be considered a side dish, but if you have enough of a side dish it becomes a whole dish, right?? If you want to see some of our foodie adventures in L.A. you can follow Salted Gold on Instagram(@salted.gold). Preheat oven to 400 degrees F. Bake bacon on foil lined baking sheet and bake for 10 minutes. Once the bacon is partially cooked set aside and place a wire rack on top of the baking sheet. Spray the rack with nonstick spray. Place butter and garlic in microwaveable bowl and microwave for 30 seconds. Mix in sesame oil, brown sugar, soy sauce, and garlic. Set aside. 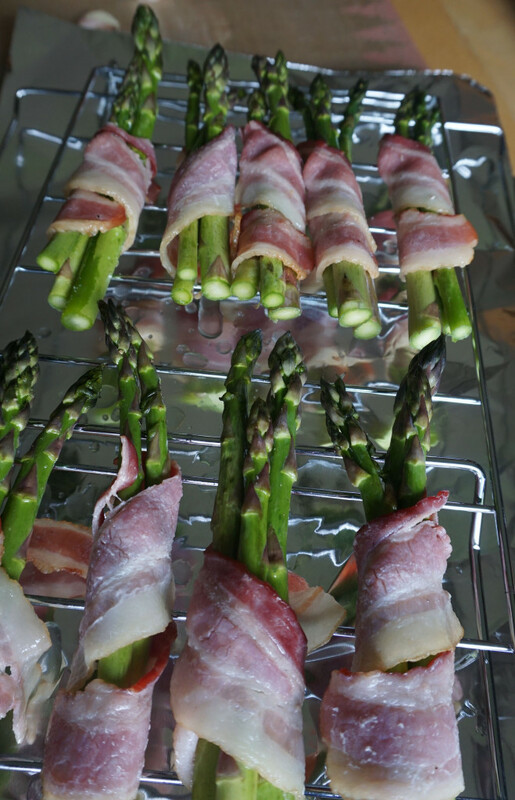 Bunch together 3 asparagus spears and tightly wrap a piece of bacon around the bundle. Secure with toothpick if desired. Place on the wire rack seam-side down and repeat. Using a pastry brush, a spoon or even your hands, brush the spears thoroughly with the mixture(save some for brushing the asparagus halfway through cooking. 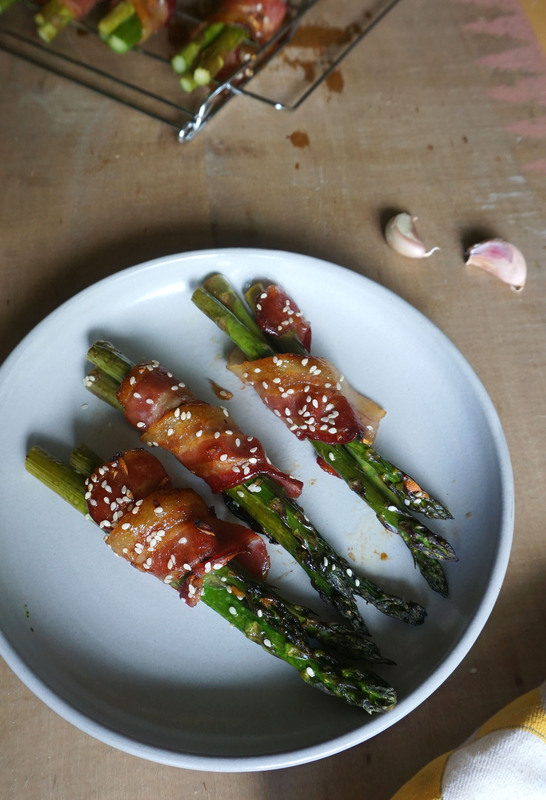 Give each bundle a hefty sprinkle of sesame seeds. Roast for 18-20 minutes, brushing asparagus with mixture hallway through cooking. Serve warm.